Well, it’s time to announce a brand new Valcour Records release! Like all of them we’re very proud of this one, but this one is especially special to me. For one, this is the first actual record that Miss Kelli Jones and I have ever made together. As most of y’all know, Kel and I have been playing together onstage and on records for over ten years, but we have never actually found time to record together for our own project until recently. There is quite a story that goes into these four little songs ending up on a piece of vinyl, so I thought it would be fun to recount to you all just how this came to be. It's called Toi, Tu Joues à L’amour. Hope you enjoy! The story begins for me back in 1996 if I remember correctly. My parents’ old friend Ed Littlefield Jr. came down to visit us in Eunice from the state of Washington. By then I was playing fiddle and some guitar and we had a great time hanging out with Ed and his partner Julia- so much fun that it was decided that he and his recording engineer Daniel Protheroe, aka Ace, would return before too long to record my folks and the Savoy-Smith Cajun Band live at the St Thomas Moore Mardi Gras Ball (and Ed joined in on pedal steel guitar). They flew in with huge road cases of tube microphone preamps and other gear and I was fascinated by the gear and the process- instantly hooked! That summer I was invited to go spend some time up at Ed’s beautiful studio in Arlington WA to learn more about recording, and I also traveled with him and his crew to the Festival of American Fiddle Tunes in Port Townsend WA, where I had not been since I was 3 or 4 years old. I spent an incredible week at Fiddle Tunes (it may have been two weeks that year for the anniversary), and returned home more eager than ever to learn, create, record and produce music – it was a very formative part of the rest of my life. (Coincidentally, today I am the Artistic Director of that same festival!) I returned to Fiddle Tunes and Blues week with Ed several more times over the next few years and accompanied him on some other amazing adventures, but let’s fast-forward a bit to October of 2015. Ed and some of his friends and bandmates regularly take these wonderful trips hosted by the Castles and Concerts group on what happens to be the world’s largest fully-rigged sailboat, the Royal Clipper. Kel and I and the fam were invited to join them on several of these, but in October of 2015 we were invited to go spend a week with them wining and dining in the Bussaco Palace of Luso, Portugal. It was nothing short of amazing – beautiful concerts and meals every night, and we had a blast hanging out with Wilson and his girlfriend Rachel and my old friends who I had known since the early days of Fiddle Tunes (who are the offspring of Ed’s bandmates) and their partners. Every night was a new adventure, but one night we got a little more wild than maybe we should have and we started exploring the castle- particularly the parts that we weren’t allowed to explore… I won’t go into details, but while exploring, the ever-musical Kel found this old dusty French Petula Clark 45 rpm record in a pile of trash and wanted to check it out. Anyway, it ended up in her suitcase. So we eventually get home to Eunice and that 45 ends up in a stack of other 45s and gets forgotten. Not long after that, I was finally able to purchase a jukebox I had been eyeing for some time from my friend Todd Ortego- a vintage 1958 Seeburg 222 – the first stereo jukebox ever made I believe. Guess what? It didn’t come with records, so that stack of 45s in my living room found a new home and guess which one started getting played a lot? This one by Petula Clark from the 1960s with two songs on each side, the last song on the B Side being a melancholy pop song called “Toi, Tu Joues à L’amour”! You might think the story ends there, but there’s more! So we have been friends with Ed for a long time now and he’s recently built an absolutely incredible masterpiece of a recording studio up on his farm up in Washington, north of Seattle. We still see him often – definitely at Fiddle Tunes every year, and after a week at an intense music festival there’s nothing like spending some time at the farm to unwind, which is exactly what we did last summer. And since we were going to be there for a few days we figured we might as well record a track or two for fun so Ed graciously enlisted his recording engineer Jordan Cunningham to spend a day with us. 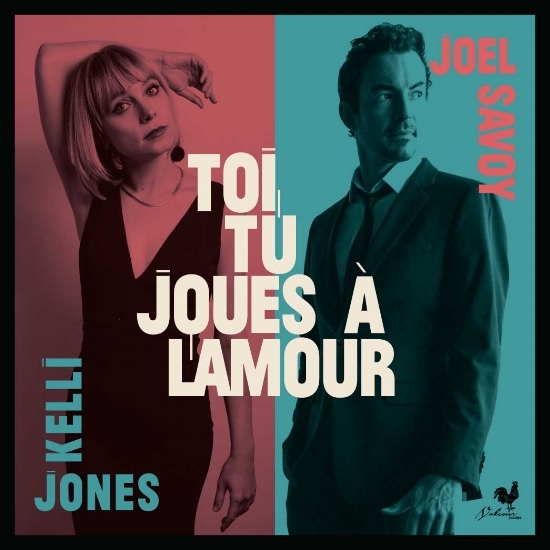 Kel and I had never tried to play “Toi, Tu Joues à L’amour” before, much less on fiddles, but we decided that since we were at Ed’s, without whom we would not have discovered the song, we had to record it then and there. So the night before we were to record we sat up late in the great room at Ed’s house learning it and working up the arrangement. The next day we sat down with our fiddles, facing each other only a few feet apart in the main room of the studio and played music together, LIVE – they way that I wish I could always record – and Jordan did a great job of capturing the feeling of the day. The other three tracks we recorded are equally special to us, but without the globetrotting background. On a 7” 45rpm record, you can fit 5 minutes or less per side, so we could only include one other track on the vinyl, so it seems fitting to me for the B Side to pay homage to two contemporary Cajun fiddle heroes of mine, my “uncle” Michael Doucet and my friend the late Al Berard. The two tunes in this set, “The Attakapas Trail” by Al and “Reel de Nez Picqués” by Mike are wonderful examples of new Cajun fiddle tunes that are being written in Acadiana today. The other two tracks had to be included as a download since they made each side too long. Kel and I have been playing this Dennis McGee Medley for a while- Dennis’ recordings from the 20s and 30s remain to this day my favorite Cajun music. The first tune comes from another Valcour release “Dennis McGee, Himself” and he calls it the “Reel de Marcantel” on that record. The second tune is called the Barza Reel and this version is a spin on an arrangement that I used to play a lot with another contemporary Cajun fiddle hero of mine, David Greely. The last track we cut is a song called “Dedans la Louisiane” and it comes from the great Cajun songwriter Vin Bruce from down south in Cutoff Louisiana. I’ve heard my parents sing this song as a duet since I was a baby and I love the lyrics (slightly adapted here by me and borrowed from some other versions, including a great version by Cheese Read). I played Heather Littlefield’s gorgeous Santa Cruz 00-21 guitar on this one in a drop tuning. So you can see, everything has a story. We cut these four songs live and I loved Jourdan’s rough mixes so much we didn’t touch ‘em. To me, there’s nothing like making mixes either during or right after the recording session – even if they’re not perfect they always seem more connected to the music – more emotional somehow. So this is us, the way we are. Two best friends playing fiddles together in a gorgeous room with no reverb or nothing, and I hope you will enjoy our effort to make quality, honest, real music. A huge thanks to all those mentioned here, too. For everything! Now you may ask yourself why release this on a 7” 45rpm record? Believe me, when I first looked at the numbers (see the breakdown below) I was asking myself the same question. But there’s a good answer. I’ve just spent an entire morning writing about how special this thing is for me- the music, the story of finding and learning the songs, the history of the songs and the connections to the people that made them, and the remaking of these songs with my dear friend Kelli Jones. We wanted to make a special product that reflects the way we feel about the content. So we dressed it up and pressed 300 copies on opaque white vinyl in nice full color jackets with a card in each one to download all four tracks for those who don’t have a record player. So here’s the deal: there are only 300 of these in the world and we ain’t makin’ no more, so if you like what we made here and would like to be part of this little story, please buy a copy. Thanks for listening and until next time, lâche pas la patate! The bad news for us is that our friend Mr. Belton Richard is now on that rotating schedule at the big dancehall in the sky with all the other Cajun greats that we’ve lost. He became a legend in his own time and he’ll live on forever through his iconic songs and recordings which have influenced so many of us immensely. A lot of you know that we recently produced a record called “Cajun Accordion Kings (and the Queen)” and we tried really hard to get Belton to be a part of it. I’ve known Belton for years but hadn’t been in touch with him recently when we were recording this project so my co-producer Steve Riley and I tracked down his current phone number and left him a few messages to try to set up a session with him at his house. Understandably, he never got back to us – there were two recent deaths in his family and we knew it just wasn’t a good time. Thus encouraged, I called my buddy Todd Ortego at KBON to see if he knew where Belton’s house was. He said “I’ve only been there once but go like you’re going to Cankton and before you get into town take a right on a blacktop road and go down about a mile and his house is on the right.” So Jo and I took off in my car with one of Dirk’s accordions and we headed towards Cankton, stopping to pick up what I knew to be Belton’s beer of choice, Michelob Ultra, and a couple pounds of boudin from Billy’s along the way. This was a wild hare chase if ever there was one – we had no idea where we were going and we had no idea if Belton would even be there if we found his house, much less what kind of shape he’d be in and if he’d agree to record a song for us. But we were determined, so headed north to Cankton and as we got close to town I chose a random “black top” and turned right. Just as we started questioning ourselves heading down this completely random road, almost magically, this old man in overalls with a sunburst Gibson Les Paul over his shoulder appeared exiting a beat up tin shed in the middle of a pasture in front of a house. Jo and I looked at each other and stopped the car immediately. “This guy has to know where Belton is!” Jo said. So we hollered at him across the ditch, “Hey do you know where Belton Richard lives? !” The old guy turned around with his unplugged electric guitar and said, “Accordion man? You see those trash cans down there? Take a right right there and that’s his house.” Both totally amazed that we had somehow ended up on the right road and found this guitar-slinging faun in a field who knew where we needed to go, Jo and I drove into Belton’s driveway. Unfortunately, right then my phone rang and it was Todd calling to tel me that Belton had just moved to Broussard and wasn’t doing well enough to record anyway. So we drank the beer and ate the boudin and decided we’d have to include him on Volume 2. Today, sitting in Portland Oregon getting ready to play a Cajun dance I really regret that this story doesn’t end with Jo and I sitting under the carport drinking beer and eating boudin with the legendary Belton Richard, and I regret that I won’t be around to attend the funeral as he’s laid to rest. However, I’ll always remember this little adventure and the few times I got to hang out with him, and tonight when we get onstage and get going, I hope Belton will hear his songs and look down with a smile knowing that we tried to find him that day and that he might not be with us any longer, but Belton Richard, the Legend, lives on! Rest in peace, Belton Richard. Enjoy le paradis de musicien! We are excited to share our latest endeavor with you all! Cajun Accordion Kings (and the Queen) is a collection of songs performed on solo accordion by of 16 the Cajun accordion masters across south Louisiana. All my life I have loved the sound of the Cajun accordion by itself- it's a band in a box and I've wanted to do this project for years. So when my cousin Steve Riley called me up to tell me about the Cajun Accordion Heroes show he was organizing at the Liberty Theater on March 11, I jumped at the opportunity and asked Steve to coproduce this project with me. I would first of all like to say thanks to all of these players who took time to be a part of this- this project is very special to me and each of you has contributed a unique and beautiful performance. I would also like to say that this is not the definitive list of the best Cajun accordion players. Let's call it Volume 1, because there are so many great players in the older generation alone that we were not able to include, such as Belton Richard, Nolan Cormier, Reggie Matte, Andrew Cormier, Jimmy Thibodeaux and more. So there's a good chance this project is "to be continued." We haven't even touched on the great Creole and Zydeco players yet! I'd also like to say that this is basically a collection of modern field recordings. Each track was recorded and filmed live in a full take with no editing, in numerous non-studio environments. Some of the players also chose to sing, but you will notice the the vocal is generally low in the mix because I really wanted to showcase the accordion so i tasked the mic pair to the instrument alone. When you listen to these tracks or watch these videos, you will hear 16 distinctly unique styles. Capturing each performance was a beautiful experience forphotographer/videographer Jo Vidrine and I and I am proud to share this with you from all of us at Valcour Records. Listen to Jimmy Breaux's rock solid timing, and Marc Savoy's style and grace, Steve Riley's and Jason Frey's precision and speed. There's Jo-El Sonniers sweet dedication to his mother after a heartfelt performance and Paul Daigle's rhythmic ferocity. Listen to Wayne Toups hammering out an old favorite at max volume, or to Ray Abshire delicately delivering the blues. This is definitely NOT a bunch of "chank a chank." And check out the videos below, filmed by Jo Vidrine. Well school’s back in session and the long hot Louisiana summer is drawing to an end. With all the rain we’ve been getting and the devastating floods, I think everyone is anticipating more than usual that first fall breeze that tells us that another season of festivals is upon us and the leaves will soon be crunching under our feet. We are doing our best in Louisiana to move on to the next phase, and we are lucky we have a lot to look forward to. Here in Eunice, Valcour Records headquarters is bustling with lots of new projects. Our studios have been busy with some of the finest musicians in the area all year long and it’s nearly time to share some of their work with y’all, including Courtney Granger’s highly-anticipated debut Country album (recorded and produced by Dirk Powell, also available in vinyl), an epic new record from the ever-creative Bonsoir, Catin, and a special Christmas surprise. We’ve also got some projects just getting started with some new faces on the scene in Acadiana and a tribute to one of our local heroes we lost last year, so be sure to sign up for the mailing list so you can be the first to hear all this stuff! Here at Valcour, our mission is to share the music we love from Acadiana with the rest of the world. As musicians ourselves we’ve worked hard over these last 11 years to develop and refine a release model that is artist-centric and we’re doing our best to benefit our local artists on an international level because we believe that what we have down here could do the world some good. Am I right?! However, we are a small company and we can only devote so much of our time to our passion of music. I wish it were possible for us to release all of the great albums that come out of this area – maybe one day we will be able to do that – but for now we can only handle a few releases a year at best. This season our babies were I Wanna Sing Right: Rediscovering Lomax in the Evangeline Country – our four-disc boxed set featuring 24 new versions of songs recorded in South Louisiana in 1934 by Alan Lomax – and T’Monde’s Yesterday’s Gone, Drew, Kelli and Megan’s second album together leaving nothing to be desired from this powerful Cajun trio. But there were a lot of other great releases this year- it’s hard to even remember them all! Let’s see, Wayne Toups put out a fantastic new album this year featuring his hit single A Good One. Roddie Romero and the Hub City Allstars killed it with their huge-sounding Gulf Stream. The Viatones reminded us o f what Rock’n’Roll is supposed to sound like with their eponymous debut release. And Dr. Barry Jean Ancelet and the inimitable Sam Broussard collaborated with poetry and music on their Broken Promised Land, which I have been eagerly awaiting since I first heard the demos several years ago! Also, young Forest Huval debuted with another eponymous album featuring Kyle Hebert on fiddle which has some really great tunes that the late Al Berard loved to play. That's just the tip of the iceberg- I’m sure there are another half-dozen releases from Acadiana I have been listening to that I just can’t think of right now. All this wonderful music keeping us going in good times and bad. That’s why we do it, because it brings us together, and together we will remain Louisiana Strong. Maw-maw, ma-ma, me-me, me-maw. We who have had them cherish them. They are special. They are our matriarchs and the beating heart of our family. The archetype of the Cajun & Creole grandmother is one that is fading. Valcour's Lucius Fontenot wants to photograph and document as many as he can in the next year. Not only to create portraits that honor them but to hear their stories, which in the end are our stories. You can help with this project. Nominate your maw-maw or someone else's maw-maw by contacting Lu. Each will receive an 8x10 for their time. Lu's previous project focused on photographs and stories about Hitachi rice cookers - the standard for a generation of Cajun cooks and homemakers that defined the way rice "should" taste. HIs study was captured in this story with Lafayette Travel. Louisiana has an abundance of talented artists and it can be very challenging deciding whom to feature on Art Rocks. When one of my colleagues suggested we do a profile on Cedric Watson, a Lafayette musician with four Grammy nominations, I was unfamiliar with the name—perhaps because I am of another generation. But when I heard him perform, recognized his accomplishments, and saw his commitment to preserving traditional Creole music; I knew I had to tell Cedric’s story. What a treat when we finally found the opportunity to sit down for an interview! Cedric has a vibrant personality, very open and refreshingly honest. From the few hours I got to spend with Cedric, I feel Louisiana is very fortunate to have him represent us in the music world, not only because of his talent but because of his overall disposition. What an ambassador for Creole music! Watch the full episode of Art Rocks on the LPB website. Well, the day has finally come: all four CDs in our ten-year anniversary box set, I Wanna Sing Right: Rediscovering Lomax in the Evangeline Country have arrived! Please do yourself a favor and listen to some tracks. This project, produced by Joel Savoy and Joshua Caffery and featuring so many of Louisiana's most talented musicians, is our largest musical undertaking to date. We just can't say enough about how cool it turned out - the way these artists have taken these old recordings and given them new life. We couldn't have picked a better collection to mark our first decade of producing and promoting Louisiana music. The full collection features 24 tracks (and maybe an extra hidden surprise) by an incredible group of musicians, including Michael Doucet, Marc Broussard, Wayne Toups, Zachary Richard, Tiffany Lamson, Steve Riley, Ann Savoy, Dirk Powell, Roddie Romero, Cedric Watson, David Greely, Joel Savoy, Kelli Jones-Savoy, Wilson Savoy, Anna Laura Edmiston, Kristi Guillory, Joshua Caffery, Claire Caffery, Barry Ancelet, Carl Brazell, Megan Brown and Aurora Nealand. If you want to see some of this music performed live by many of the artists featured in the box set, join us at the Acadiana Center for the Arts on January 14 or 15 for a special kind of showcase. Narrated by Dr. Barry Ancelet and presented in music, story and visuals, this show will take you on a musical journey across South Louisiana as documented by Lomax in 1934. We also got to work with some talented visual artists in putting the packaging together for the box set, including Rachel Meirs (Part One), Frederick Stivers (Part Two), Gabrielle Savoy (Part Three), and Cayla Mattea Zeek (Part Four). Learn more about the book that inspired this project, Joshua Caffery's Traditional Music in Coastal Louisiana: The 1934 Lomax Recordings, here. Yvette Landry is one of our favorite Acadiana musicians - she has appeared on some of our releases in the past, but you may or may not have had a chance to hear her solo work. Yvette plays soulful country music the way it is supposed to be played, and we thought her sound would lend itself greatly to a Christmas release. And with Oh, What a Silent Night, we found out we were right! This small collection of country-style Christmas carols is available through our website only as a download. The Breaux Bridge songstress is accompanied by Richard Comeaux on the pedal steel guitar, Beau Thomas on fiddle, and Trevor Landry on drums. We hope it helps bring some beauty, soul, and even a little country blues to your holiday sound track! But wait - there's even more music! Last month, just in time for Festivals Acadiens et Créoles, we released a great folky Cajun recording with a great young Acadiana band called T'Monde, featuring Megan Brown, Kelli Jones, and Drew Simon. Bringing together influences ranging from early Country music to ancient French and Creole ballads to present day Cajun music, T’Monde plays music that is made for the ears as well as the feet. No where is this description truer than on Yesterday's Gone. Valcour wishes you a safe and happy holiday season - and thanks for supporting us for ten years! It’s festival time again in southwest Louisiana! Fall is just around the corner- the mornings are getting cooler and all of Acadiana is eager to celebrate the end of summer with Festivals Acadiens et Creoles. Here at Valcour headquarters we too are ready for festival season and the inevitable winding down of the year that brings us together with friends and family for the holidays. So much has happened this year! As I type this I’m listening to the final mixes for the fourth part of our milestone project, Rediscovering Lomax in the Evangeline Country: twenty four tracks recorded and mixed over the last 18 months featuring a very big handful of Acadiana’s finest artists. After a year and half working on it, it’s hard to believe that this project is just about wrapped up and that our tenth year in business is drawing to a close. I certainly hope you’ve all enjoyed it and I want to thank you all for your support over these last ten years- we couldn’t have gotten this far without you!